With your kids being back at school, it can be a challenge to find new and interesting ways to keep lunch boxes filled with nutritious goodies! 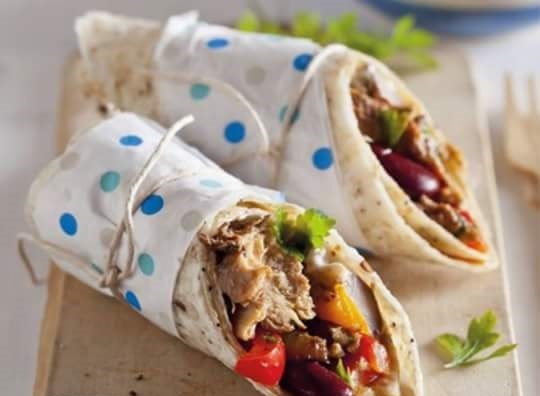 Instead of a sandwich, why not pop this scrumptious Sardine and Bean Wrap into their lunch box this week? Drain the Sardines and keep the sauce. Heat the oil in a shallow saucepan or wok and sizzle the onion and garlic to a light golden color. Add the red pepper and chilies (if you’re adding them) and fry for 1 to 2 minutes. Add the beans and Sardines, stir well and heat through. Season with pepper. Remove from the heat and stir in the coriander or parsley. Mix together the tomato sauce from the Sardines and the cottage cheese. Lay the wraps on a wooden board, dollop cottage cheese on the wraps and pile the warm sardines on top. Roll up.